"I'd be pissed if I were his partner." –Hero after Able botched powerbombing his partner Raymond onto Chavis. 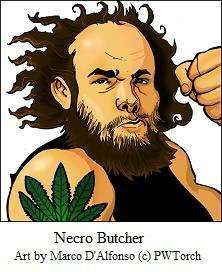 "Redneck karate"- Hero on Mark Briscoe's karate chops. Overall thoughts: (7.0) There's a lot of great wrestling on Final Countdown Dayton and the new features and production values are a welcome bonus, but there are also some detractions on this DVD that take away from its value. Let's hit the high points first. The new audio options are a welcome feature. Viewers can choose from surround with commentary, surround without commentary, and stereo with commentary. I really enjoyed the promos and video packages inserted throughout the show. This is something that has been sorely missing from most ROH DVDs this year. The announcers even smoothly transitioned to the interviews and video packages, which gave the show a sense of pacing. I also enjoyed the new graphics for the ring entrances and the new transition graphics that moved the show along nicely. The build to the main event was really well done with Hero getting featured in two video packages. One was shown at the beginning of the DVD and another UFC style video package with Hero training with boxers was shown right before the Hero-Danielson main event. The new commentary team of Chris Hero and Dave Prazak was also really good at times, but they started off slow. I'm going to miss Lenny Leonard on commentary in ROH. I thought he was really good and brought an element of professionalism to the broadcast booth. Hero was really good at times on commentary and made some hilarious comments about several of the wrestlers. I think he has the potential to be really good in his role on commentary. If anything, it was nice not to have to listen to Prazak doing heel commentary for a change. The biggest detraction on the show is that the hard camera isn't focused and looks a little blurry. It doesn't make the show unwatchable, but it's annoying and I'm surprised the camera crew didn't bother to fix this during the show. There are some darn good matches on this show. If you take away the problems with the hard camera shot, this is one of the best ROH DVD releases of 2009. The show features two excellent matches at the 4 star level with the Richards-Castagnoli and Hero-Danielson contests tearing down the house. The undercard is really good on this DVD. The Albright-Edwards, Young Bucks-Briscoes, and DCFC-House of Truth matches were all very good. 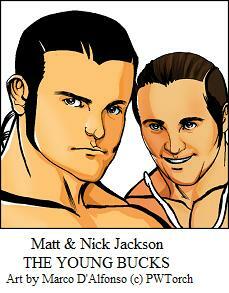 The Young Bucks-Briscoes match was somewhat of a disappointment because I expected more, but it was still really good. Necro's brawl with Rave was also well-executed and the crowd was red hot during their segment. Richards and Castagnoli both came across like stars in their match. Despite being heels, both men put together a match that had the crowd on their feet at times. Castagnoli's no hands torture rack airplane spin was simply awesome and Richards is just a machine in the ring. Chris Hero has been getting better and better in 2009 and his last two matches against Lance Storm and Bryan Danielson have been really good. Hero and Danielson put on an excellent main event that had the Dayton fans, who were fantastic all night, on their feet down the stretch. Hero got a big win over Danielson, but it's not going to mean anything unless creative keeps putting him over. 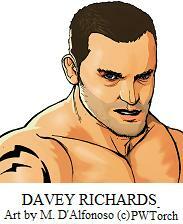 Hero and Richards could be superstars for ROH if the company got behind them the right way. I give this DVD a solid recommendation.